Judy Ann Santos will only allow her children Yohan, Lucho, and Luna to enter social media when they reach 18. Yohan Agoncillo does not have a social media account, which is quite unusual for a teenager who has famous parents. There is a simple explanation, according to her mom Judy Ann Santos: She isn't 18 yet. For Judy Ann, it is important that her daughter enters social media at the right time and age. The ABS-CBN actress said, "We don't allow her, I told her kasi na we have to follow the rules of what's in Facebook. "If you're 18, that's the only time that you can have your Facebook account or any social media account because yun yung nakalagay na rule or agreement. "We don't want to lie about your age. There are specific reasons why you have to be of age. "You have to be responsible. There are content in this social media thing na baka ikakagulat mo, 'tapos hindi ka pa ready for your age. "So, don't feel bad kung lahat ng kaibigan mo may social media account. Iba lang yung paniniwala nila diyan, but ako naniniwala ako na it's not yet time. "We have to be responsible already to have your own account." PEP.ph (Philippine Entertainment Portal) met with Judy Ann during an intimate lunch event back in March. 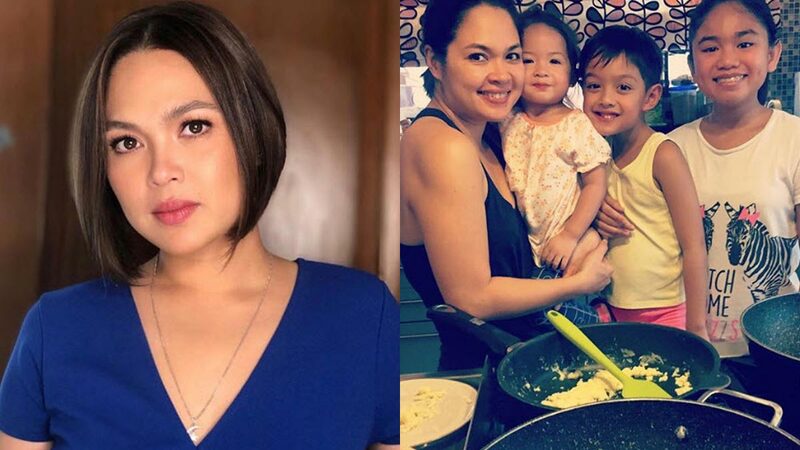 Even though her kids have yet to fully grasp what being a "celebrity family" means, Judy Ann has made them aware of the responsibility that goes with their status as celebrity kids. The mother of three remarked, "Sabi ko, 'Whatever you do is magnified. Whatever you say, there's a responsibility behind that. "'And, at the same time, since you're considered a celebrity also, you have to think of the things you're going to put that will inspire people.'" Judy Ann knew that one way or the other, her kids will be part of social media and they may become celebrities on their own right. "Kasi yun na yun, e. It's inevitable, e. At one time or another, magiging celebrities sila or yun yung gagawin nila. "But early on pa lang, you have teach them na the responsibilities of being a celebrity... Parang if you don't tell it to them, mahirap." "Actually yes, oo, mahirap. Mag-aaral ka na lang."